Best Season September - October, April – May. Maximum altitude gain Kusum kangru 6367m. Kusum Kanguru Peak lies in the Khumbu region that forms a border between Hinku valley in the north and Dudhkoshi valley in the south. The name suggests ‘three snow white gods’ in Tibetan language. The peak is an impressive rock and ice peak with three summits of which north face summit is more exciting. This peak can be climbed from two sides: one is from the north ridge and the second one is from South East Ridge from Hinku Valley side. Kusum Kanguru peak climbing is the challenging and adventurous from both possible routes and is suited for those who have enough alpine mountaineering experience. Kusum Kanguru peak offers the fantastic panoramic view of the Himalayas like Mt. Everest (8848m. ), Cho-Oyu (8201m. ), Lhotse (8516m. 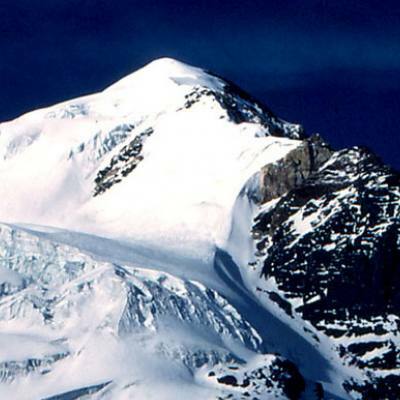 ), Makalu (8463m. 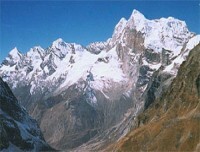 ), Nuptse (7855m.) Thamserku, Amadablam and Kwongde etc. The journey to the Kusum Kanguru peak starts from Lukla after the 30 minutes flight from Kathmandu. Along with the climbing experience and the views from the summit, the trekking to the base camp of the peak adds further pleasure to the trekkers. From Lukla you follow the trekking trail of Everest base camp up to Manjo. Then you leave the EBC trekking trail and move towards the east – south and from there it takes two days to reach the base camp of the Kusum Kanguru. On the way you can explore the culture and lifestyle of the Sherpa people. You traverse through the forest of rhododendron and pine where you can explore various types of the flora and fauna and wildlife. 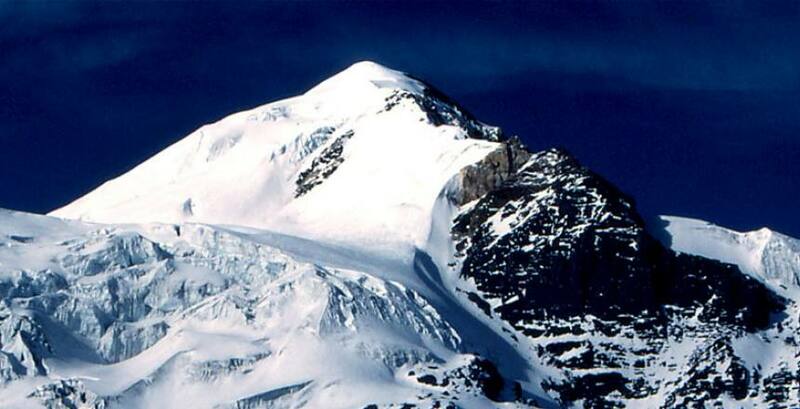 The best seasons to go for Kusum Kanguru peak climbing are spring and autumn. Day 14: Trek to Tashmg Ongma. Day 03Flight to Lukla and trek to Chutanga (3100m.) In the morning you have a scenic flight to Lukla (2800m.) from Kathmandu. It takes 30-40 minutes to reach Lukla. Then you start your trek and head to Chutanga. Day 04Acclimatization day This day we take rest for the proper acclimatization. We visit some beautiful places around Chutang. Day 05Chutanga to Tuli Kharka (4400m.) This day we trek from Chutanga to Thuli Kharka. It takes around six hours to reach Thuli Kharka. We pass through the forest of rhododendron and pine. Day 08Rest day at Tangnang This day we take rest to for proper acclimatization in the high altitude. We take some excursion around Tangnang. We visit Sabal Tsho Lake. Day 09Tangnang to Kusum Kangru Base camp After one days rest at Tangnang, we continue our journey and head to the base camp of Kusum Kangru. On the way we see the panoramic view of the surrounding mountains. Day 10Base camp to High camp I This day from the base camp we climb up to the High camp I. the route is little bit difficult. Day 11Rest Day This day we take rest and prepare for the climbing the Peak. Day 12High Camp I to High camp II After one days rest in the High camp I, today we continue our climbing to the high camp II. We enjoy the beautiful view of the mountains and glaciers. Day 13Climb the Peak and back to Base camp Today we achieve our goal. We climb the Kusum Kangru peak from the south ridge. From the peak we can see the fantastic view of the Himalayas like Mt. Everest (8848m. ), Cho-Oyu (8201m. ), Lhotse (8516m. 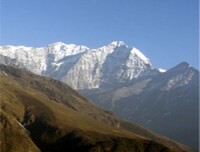 ), Makalu (8463m. ), Nuptse (7855m.) Thamserku, Amadablam and Kwongde etc. after observing the view from the summit we descend down to the base camp. Day 14Trek to Tashmg Ongma. From the base camp we retrace our route to Tashmg Ongma. Day 15Trek to Thuli Kharka This day we descend down to Thuli Kharka. We follow the previous route. We pass through the forest and terraced farm enjoying the beautiful landscapes and Mountain View. Day 16Thuli Kharka to Lukla This day also we follow the previous route and descend down to Lukla from where we started our trekking.